Sweat poured from the suntanned 10-year-old, and his calloused hands pulled on the oars as the shoreline of Santiago de Cuba disappeared behind him. In the bow, the rower’s cousin leaned over the side of the wooden skiff, a spool of line in his hands, trying to fool a barracuda. Just a couple of kids enjoying time on the water, trying to catch fish. Fifty-five years later, the rower owns one of the largest road construction companies in South Florida. His business responsibilities and family have grown, as have the size and sophistication of his boats. 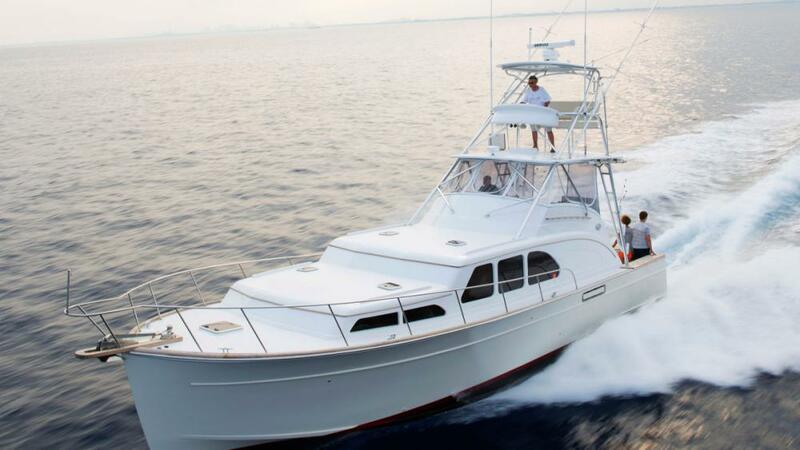 The Cuban American has moved through a series of vessels, from a small Boston Whaler to a Robalo, Tiara, Riviera and 51 Bertram. Today a 45-foot Huckins Sportfisherman sits at the dock behind his South Florida home; the classic lines of this versatile cruising and sportfishing boat stand in contrast to those of his Bertram. The Huckins has a timeless quality that reflects the owner’s evolving taste in boats. The Bertram shouts battlewagon. The Huckins 45, which debuted at the Palm Beach International Boat Show in March, was a long time coming. The owner started on the path to this build 13 years ago, when he caught a glimpse of a Huckins at the Yacht & Brokerage Show in Miami Beach. That’s where he also met Huckins Yacht owners Cindy Purcell — granddaughter of company founder Frank Pembroke Huckins — and her husband, Buddy. Read full article at Anglers Journal.